The 2018 Row by Row Experience kicks off June 21 and Intown Quilters Fabric and Yarn is again a participating shop! This is a fun, international shop hop where participants collect row patterns from shops all over the country (and even beyond). And did we mention the patterns are free? 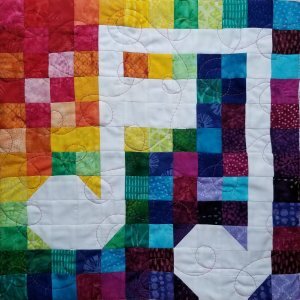 Our row for 2018 is "Decatur Rocks," which features a color wash of rainbow-hued batik squares with a musical chord in solid white as contrast. Finished quilt measures 18" x 18". Our quilt was designed to honor Decatur's own Indigo Girls, who signed their first major record deal 30 years ago. The chord is from the Grammy-nominated Closer to Fine. Order yours online for shipping beginning 11/1/18! Row by Row 2017: On the Go! The 2017 Row by Row Experience kicks off June 21 (IQ is closed on Wednesdays so the experience begins on 6/22 for us) and Intown Quilters Fabric and Yarn is again a participating shop! This is a fun, international shop hop where participants collect row patterns from shops all over the country (and even beyond). And did we mention the patterns are free? Our row for 2017 is "the Atlanta Skyline at Sunset" to honor the pretty skyline of our home. Come in for your row beginning 6/22/2017 at 10 a.m.
We can't wait to show off this year's row pattern. You'll be able to pick up a kit to make our row, as well as chose one of our three collectible license plates for this year's Row by Row Experience -- but we only have a limited quantity available for each plate. The only way to get a shop's patterns or kits until Nov. 1 is in person. Collect free row patterns from participating shops through Sept. 5. The "hibernation period" starts Sept. 6 and ends Nov. 1 when shops may sell their Row by Row patterns and kits -- including to customers online. Read all about the Row by Row Experience here and locate participating quilt shops here! 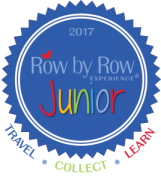 Intown Quilters is excited to be participating in the inaugural Row by Row Junior program this year! Row by Row Junior is designed for kids ages 6 to 14. They travel along with an adult and collect free row patterns designed just for them. Row by Row Junior follows the same rules and time schedule as adult Row by Row Experience, June 21 through Labor Day. Kids need to be in the shop to get the free pattern handout but anyone can buy a kit. (What a great gift or souvenir to bring home to the kids/grandkids!) We'll be awarding "I Made This!" ribbons to the first five kids who return with something made using a Row by Row Junior pattern. Any sewing effort will be celebrated, not just quilting. You can be a Row by Row winner! Complete a quilt using at least 8 different Rows from 8 different 2017 participating shops. Be the first to bring it into a shop and you win a stash of 25 fat quarters. 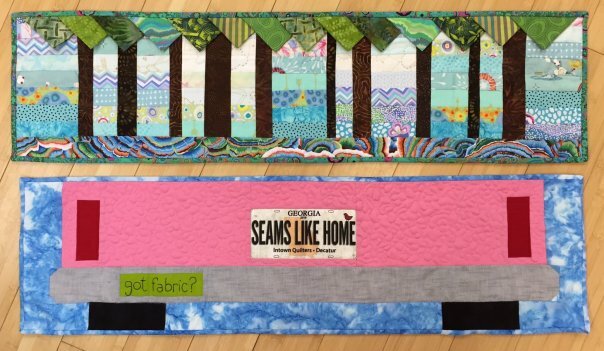 Win a bonus prize for using that store's Row in your quilt. 1. A prize for the first Row quilt that comes in between 9/6 & 10/31/2017 that includes all 8 Rows from The Greater Atlanta Quilt Shop Hop shops. You’ll have to research which shops take part in The Greater Atlanta Quilt Shop Hop, go to each to gather a Row, then make a quilt and turn it into IQ. 2. A prize for the quilt that includes a Row from the shop that’s farthest away from Intown Quilters. Who is traveling this summer? Where to? We can’t wait to see Rows from afar! 3. A 1st, 2nd and 3rd place Viewers’ Choice Award. We’ll hang all the Row quilts turned in between 9/6 & 10/31/2017, and then everyone who stops into the shop will be able to vote for her/his favorite. Encourage your friends and family to come in a vote for your quilt -- the most votes will win! Simply pick up your FREE Row by Row pattern at the cash register. We’ll add your name, email address and phone number when you check out. Only one entry with FREE Row pattern. Pop in to see what our weekly featured product is, snap a photo and post to your Instagram or Facebook page and tag us in it and we will add your name again. For each friend you refer to the shop between now and 9/5, you’ll get another entry.